Urban Decay just announced their Holiday 2011 lineup, and among the usual palettes and gift sets was the announcement of a brand new item. A new line of lip gloss, but not just any old lip gloss... STARDUST LIPGLOSS. 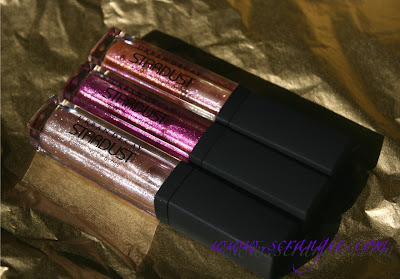 Following in the footsteps of the crazy sparkly Stardust shadows, these Stardust Sparkling Lipglosses are packed with bright, shiny, glittery goodness. My eyes practically popped out of my skull when I saw them, and I thought you all would appreciate them as much as I do. Behold. 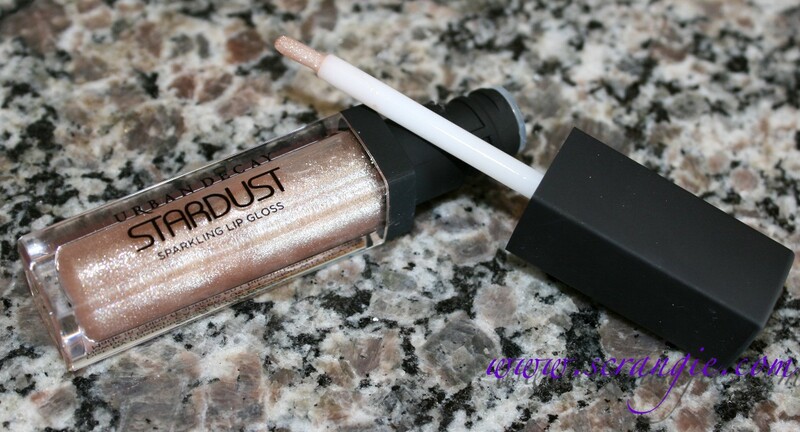 Stardust for your lips. Stardust at sunrise. I thought the light of dawn coming in through the window made the perfect lighting for this picture. 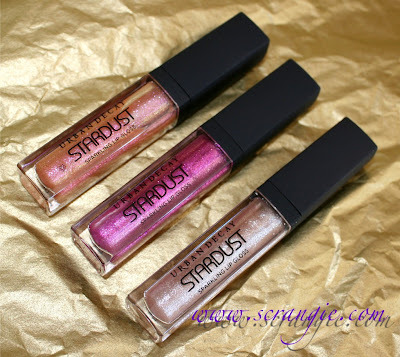 The new Urban Decay Stardust Sparkling Lipgloss comes in three shades: Andromeda (top), Space Cowboy (middle) and Glitter Rock (bottom). They're not just sparkly; they're duochrome. Andromeda is a sheer peach base with coral, peach, gold, copper, champagne and bronze microglitter and a pink duochrome flash. 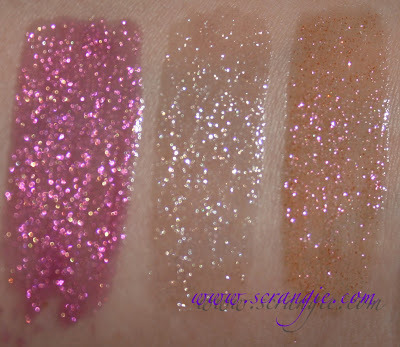 Glitter Rock is a sheer magenta base with pink, champagne, yellow/gold and clear microglitter. 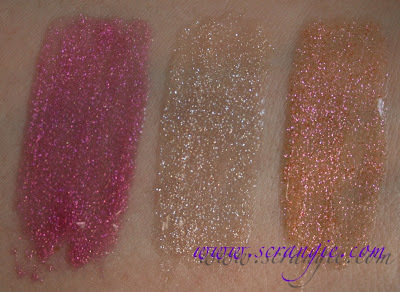 With flash: Glitter Rock, Space Cowboy, Andromeda. 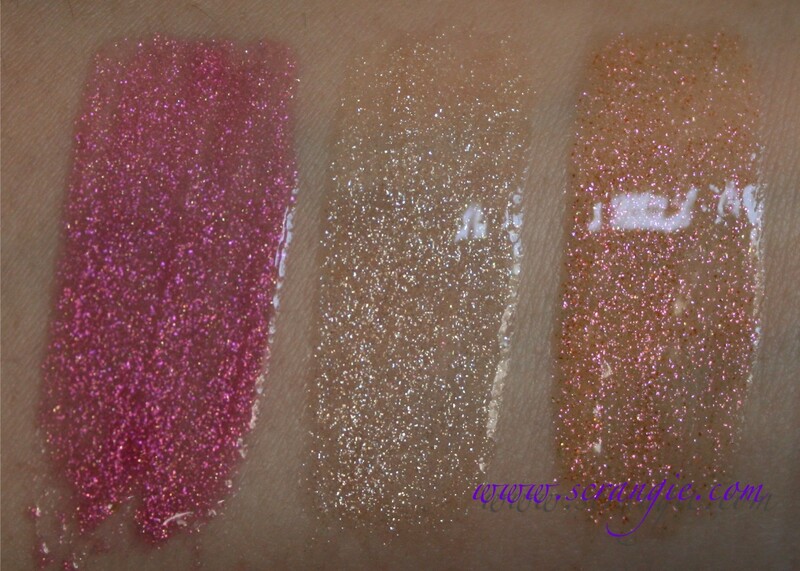 Direct sunlight: Glitter Rock, Space Cowboy, Andromeda. 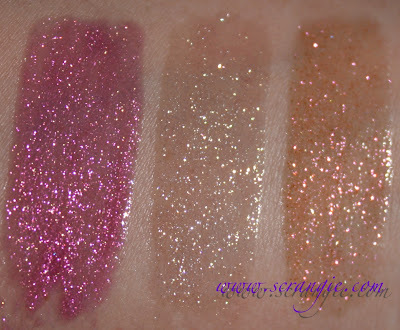 Indoors, ambient light: Glitter Rock, Space Cowboy, Andromeda. Polybutene, Hydrogenated Polyisobutene, Octyldodecanol, Hydrogenated Styrene/Isoprene Copolymer, Silica Dimethyl Silylate, Calcium Sodium Borosilicate, Mentha Piperita (Peppermint/Menthe Poivrée) Oil, Silica, Phenoxyethanol, Caprylyl Glycol, Oryzanol, Tocopheryl Acetate, Sodium Saccharin, Simmondsia Chinensis (Jojoba) Seed Oil, Tocopherol. Glitter Rock: Polybutene, Hydrogenated Polyisobutene, Octyldodecanol, Hydrogenated Styrene/Isoprene Copolymer, Silica Dimethyl Silylate, Calcium Sodium Borosilicate, Mentha Piperita (Peppermint/Menthe Poivrée) Oil, Silica, Phenoxyethanol, Caprylyl Glycol, Oryzanol, Tocopheryl Acetate, Sodium Saccharin, Simmondsia Chinensis (Jojoba) Seed Oil, Tocopherol, Tin Oxide. All Shades May Contain: CI 77891 (Titanium Dioxide), CI 77491/77492/77499 (Iron Oxides), CI 77742 (Manganese Violet), CI 15850 (Red 7 Lake), CI 42090 (Blue 1 Lake). Amazing sparkle and subtle duochrome. Absolutely no grittiness, scratchiness or chunky glitter. Very pleasant vanilla mint scent and sweet flavor. Flattering sheer colors, good for layering or wearing solo. Rubberized cap and soft brush wand packaging are a bonus. They wear away evenly and the glitter doesn't migrate onto my face. They're a bit on the sticky side. I'm having a hard time finding any downside to these. They're seriously amazing. They give the most incredible bright sparkle to my lips without looking frosty or silvery and without traditional chunky glitter. 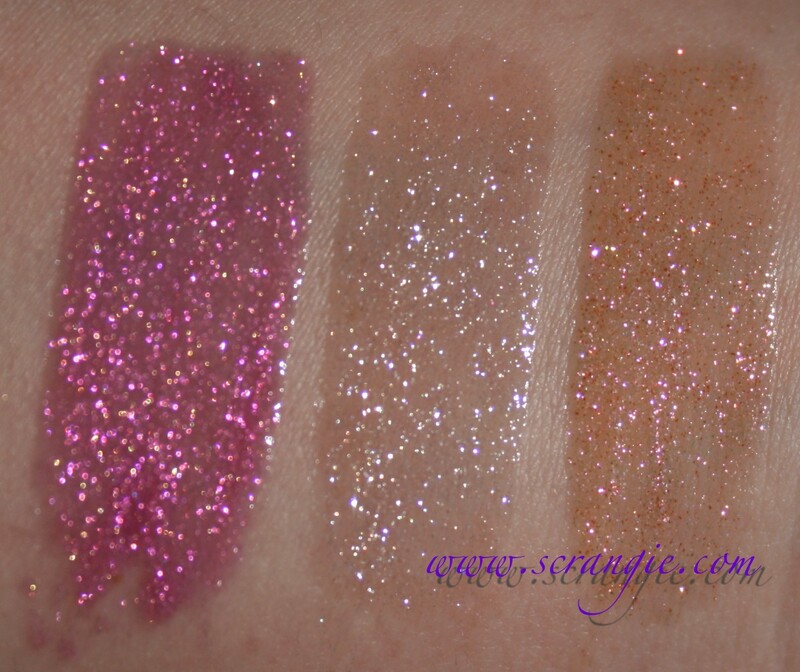 For reference, they're more sparkly than a MAC Dazzleglass, more longwearing than a LORAC Multiplex and similar in scent and texture to the regular Urban Decay Lip Junkie formula. I love that the mint scent doesn't overpower the vanilla. I really like everything about these. I would totally buy these again a million times over. Every color works on my skintone and the stardust sparkle effect is insanely pretty. Plus, they're reasonably priced at $19 for 5.5ml / 0.18 fluid ounces. Really awesome. Two thumbs up from me. 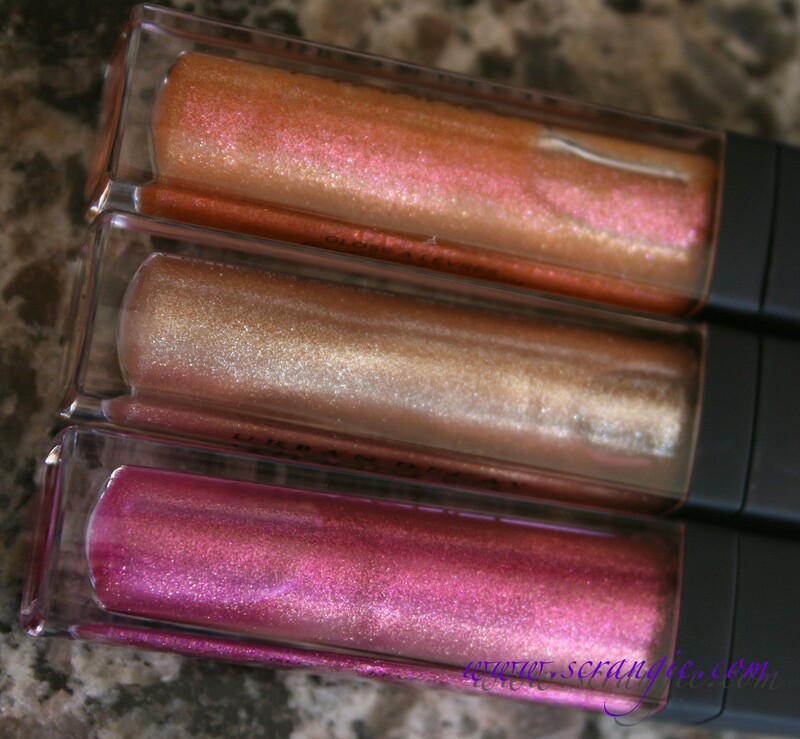 These are available now on Urban Decay's website. ooh, those look lovely! I'd probably pass on the orangey-coral one, but the other two look really nice! They're pretty, but a bit on the sticky side? 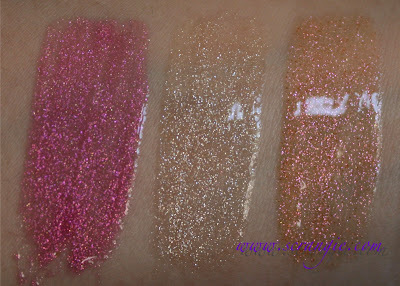 I think I'll stickwith my Milani Haute Flashes until they run out. 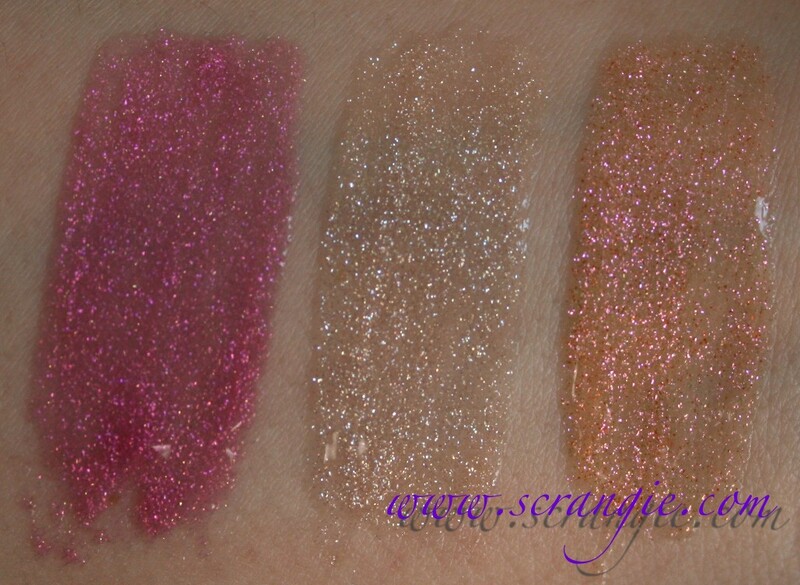 The duochrome is so pretty in the tubes! 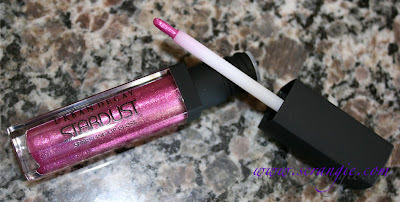 I want to like Glitter Rock because I can't get enough magenta, but I think I already have a dozen glosses like this, including the MAC dazzleglasses from last year. These look super sparkly, and the fact that they're also duochrome is pretty cool! 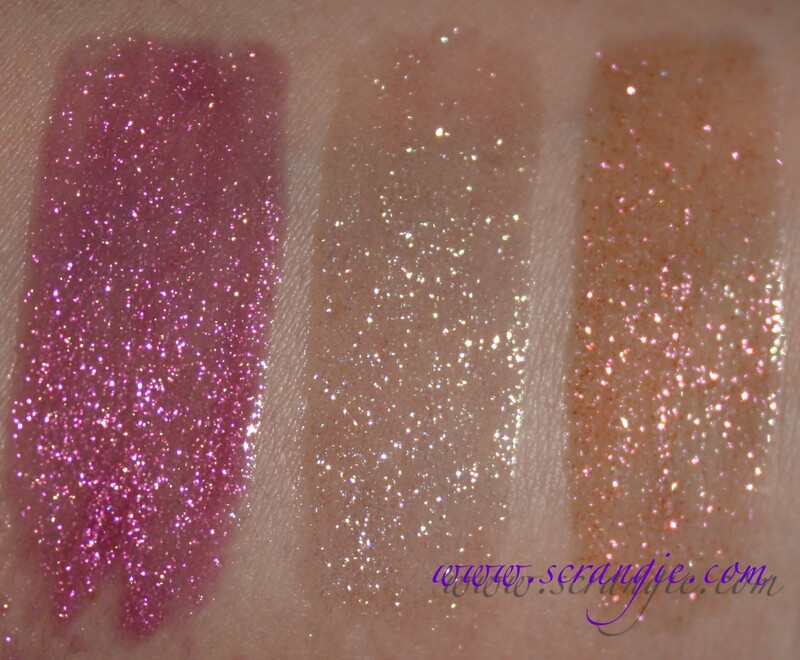 Andromeda is my winner but it reminds me of the Lorac 3D gloss. I wonder how it compares. Space Cowboy looks like a must-have! My only fear is that the brush applicator will do what the last brush-app lipgloss I bought did : turn into a gigantic splayed-out spidery looking disaster with bristles sticking out in every direction. Thanks for that, Kevyn Aucoin. 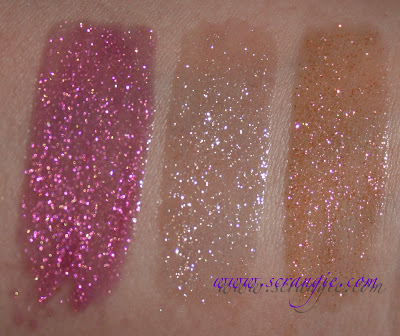 sorta reminds me of MAC Dazzleglass, i like! Love, love these. Must have these. I think your going to cost my big sweetie!